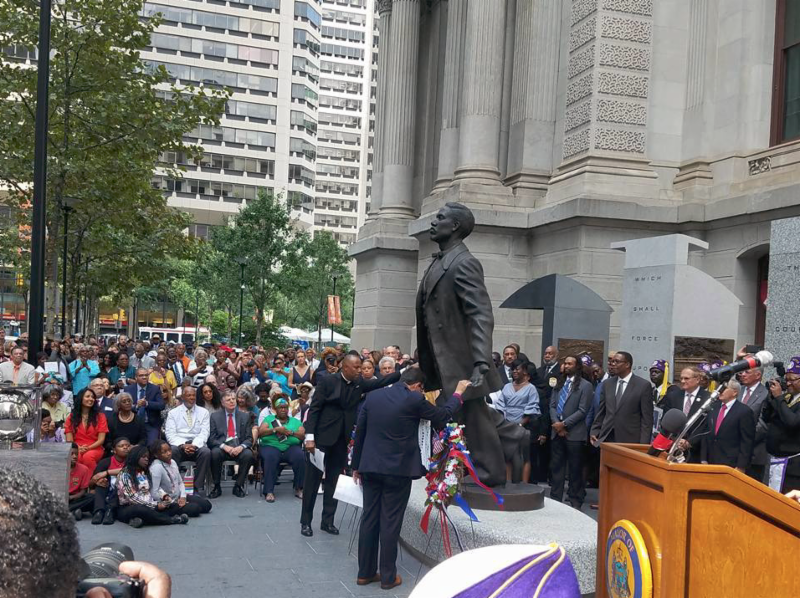 There was a public unveiling of a statue erected to remember the life, ministry and legacy of Octavius Valentine Catto held at Philadelphia City Hall. The Very Rev. Martini Shaw and the Rt. Rev. Daniel G. P. Gutiérrez (pictured below) were present and provided a Prayer for the Ceremony and blessed the statue. An Episcopalian and member of the Diocese of Pennsylvania, Octavius Valentine Catto (1839-1871) was a celebrated student at the Institute for Colored Youth (ICY) Philadelphia's premier high school for African-American youth, now Cheyney University. A leader of the National Equal Rights League, Catto spearheaded the effort to desegregate streetcars and win the vote for black men. He was assassinated on Election Day October 10, 1871. Octavius V. Catto was remembered as a "Martyr to the cause of Constitutional Liberty."